Best Sleeping Bag Liners 2019: Whether you are a regular camper or someone who likes to go outdoors only occasionally, you already know the importance of reliable sleeping gear like camping tents etc. Generally, when you are planning to spend a day or several out in the open, you need to pack the items that matter the most, beginning with a good tent. It is also equally crucial to consider the things that go inside the tent, especially your sleeping gear. In fact, how comfortable you are during the night is directly dependable on how good your sleeping materials are, and these materials do not stop at a sleeping bag but go deeper. This is why we have dedicated this post to focus on a very important item that is often overlooked by first-time campers but considered an absolute essential by the seasoned among us. So here you will find all the information related to how to pick the best sleeping bag liners 2019, along with a complete guide to the buying the topmost ones. It’s quite evident that in order to get the best trekking experience you must carry best sleeping bag liners as well. You must get a decent sleep at night if you wanna peacefully enjoy the beauty of nature and surroundings in the daylight. However, it’s not easy to pick the best sleeping bag liners for your need, that’s why we have made this list of 10 best ones to help you out. Let’s get started! The Cocoon Expedition Liner is one of the most reliable silk sleeping bag liners that can be used in almost all weathers. 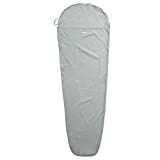 It is one of the most versatile sleeping bag liners and is very pleasant to use. If you are afraid that mummy bag liners may not be for you, you can definitely give this one a try. 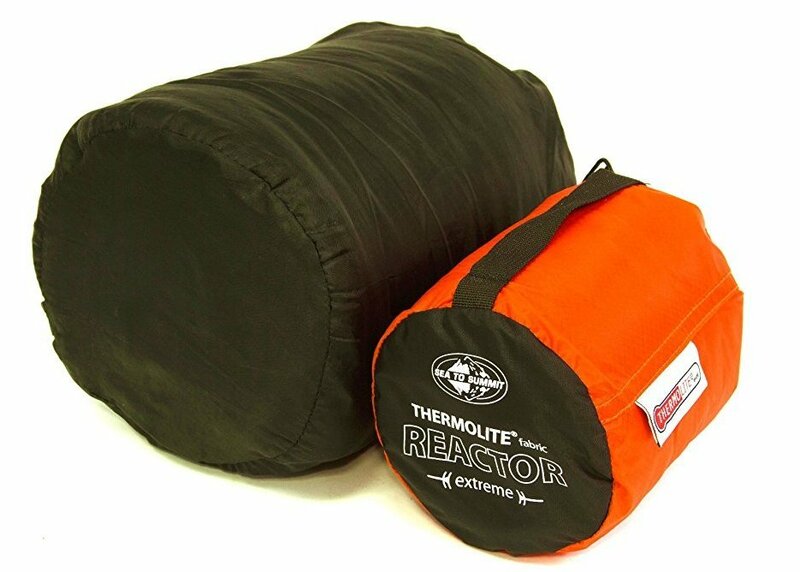 The Sea to Summit Reactor Extreme is a good sleeping bag liner for warmth and comfort. However, it is not the most versatile liner in terms of its shape and seasonality. But if you are planning to travel to a place that is bound to get cold, this will be one of the top lightweight options to beat the dipping temperatures. For climbers and winter campers, traveling light becomes a huge issue. In having to prepare to keep warm, there always seems to be an uneasy divide between freezing in the cold and carrying an uncomfortably large pack. But with the likes of the ALPS Mountaineering MicroFiber Mummy Sleeping Bag Liner, the matter is made far more convenient. Among the best lightweight sleeping bag liners for cold weathers, this one is manufactured by ALPS Mountaineering with the double aim of providing its users with an easy-to-carry liner, and keep you comfortable even in freezing temperatures. On the other hand, you will find that it can also be a good choice for carrying along on a summer trip where you can use it on its own. 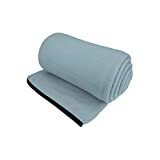 But the microfiber construction will undoubtedly add a few degree of warmth to your winter sleeping bag, while its mummy construction helps seal in the warmth. However, if you happen to feel restricted in mummy bags, this one is clearly not for you. 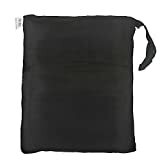 Besides keeping the user warm, the ALPS Mountaineering MicroFiber Mummy Sleeping Bag Liner also helps extend the life of your bag on account of being washable. 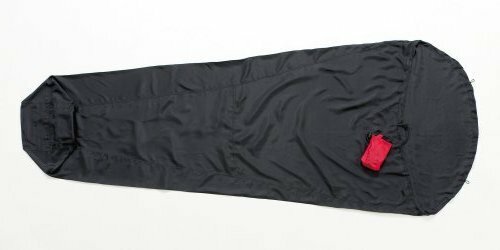 The ALPS Mountaineering MicroFiber Mummy Sleeping Bag Liner is perfect for use on its own or inside a sleeping bag to keep you warm. For campers who don’t mind a tight fit and aim to travel light, this could be a perfect choice. This one will also last you several trips, so you get good value for money. Dimensions: 32" x 86", Weight: 11 oz. Its presence also makes the liner easy to slip in to and out of. Inside the sleeping bag, however, it functions impressively thanks to its fleece make that feels warm and cozy against the skin. Unlike poor quality fleece, it does not feel itchy to the skin. But note that while being one of the best lightweight fleece liners on the market, it will not keep you warm in extremely low temperatures. It is meant to be used on moderately cool outings. It can fit into any sleeping bag, although you would benefit the most by using it in a rectangular bag. 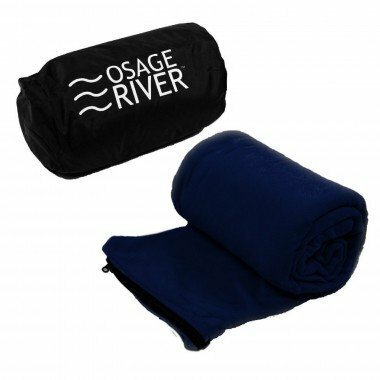 The Osage River Microfiber Zippered Sleeping Bag Liner is a great choice for those camping trips where you are expecting to be comfortable, but things might get chilly. It is high on versatility too, which means that besides being capable of being used as a blanket, it can be used by just about anyone, of any size. 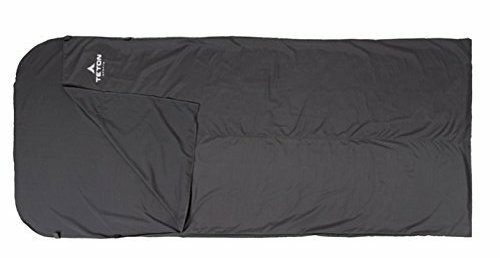 In case you prefer to go with really large liners that can double as a sheet for two people, you may benefit from buying the TETON Sports Sleeping Bag Liner. Available in cotton and polyester materials, its construction is durable, and the stitching does not chafe against the skin. Being quite large, many users complain that it tends it bunch up a lot. But on the comfort front, it is almost unparalleled. Even on cold winter nights out in the open, you will find that this adds a sufficient amount of comfortable warmth to your sleeping bag. The liners are pretty easy to get into, and in addition, they pack in really small to the favor of backpackers. The material also means that it is very easy to wash and you can clean it as many times as you want without having to worry about damaging the fabric. This TETON liner does not come with a zipper, but with the right amount of velcro to close it back up while you’re inside without any discomfort. The TETON Sports Sleeping Bag Liner is ideal for being used on those dry wintry trips that some campers have a big liking for. Besides being large enough to accommodate just about anyone regardless of their size, it also lasts through many, many trips. 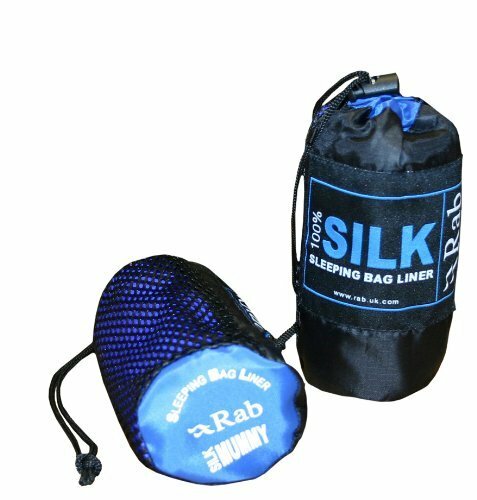 While Rab liners come in both silk and cotton variants, we recommend using the silk liners over their cotton counterparts any day. If you still have your doubts about a silk liner, check out the section above where we talk about the different materials available on the market. The Rab Silk Sleeping Bag Liner comes in one hundred percent silk material, which not only makes it a delight to have wrapped around your body on a warm night but also enables it to be packed into really small sizes. Besides, silk liner weighs the least among all the different types that you can choose from. So if you are keen on traveling alone with a light backpack, the Rab Silk Sleeping Bag Liner will make you feel like you are not carrying any extra weight at all. Designed to be slipped inside a mummy shaped sleeping bag, this one comes with a stuff sack that keeps it safely packed when not in use. Its quality is unbeatable, and you can clean it as many times as you need to. The Rab Silk Sleeping Bag Liner is for anyone who likes to travel solitary and lightweight, but in luxury. Besides upping the comfort factor, it contributes towards making your trip much more convenient in several ways. So you can take it along in colder destinations (under a very warm sleeping bag, of course), warm weather camps, and even to places where you may get a few showers. 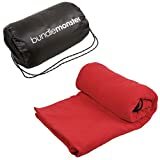 The Bundle Monster Fleece Sleeping Bag Liner is a great alternative for those who love the cozy feel of the materials but don’t want the added weight it adds to your backpack. While not the best in terms of being packed, this fleece sleeping bag liner is amazingly versatile. Note that while it is quite narrow for many to be used as a liner, the fact that it can be opened up completely to be formed into a blanket makes it special. Also, if you are built thin, you may not even find it very restrictive. However, we find that it can also fit okay into a technical sleeping bag, so while there are not many options for fleece liners in a mummy shape, you can definitely give this a try. The best part is that you can actually zip two of these together to create a bigger liner, so that helps overcome the space crunch somewhat. However, being a fleece liner, it is definitely not waterproof, so keep it away from those rainy outings. 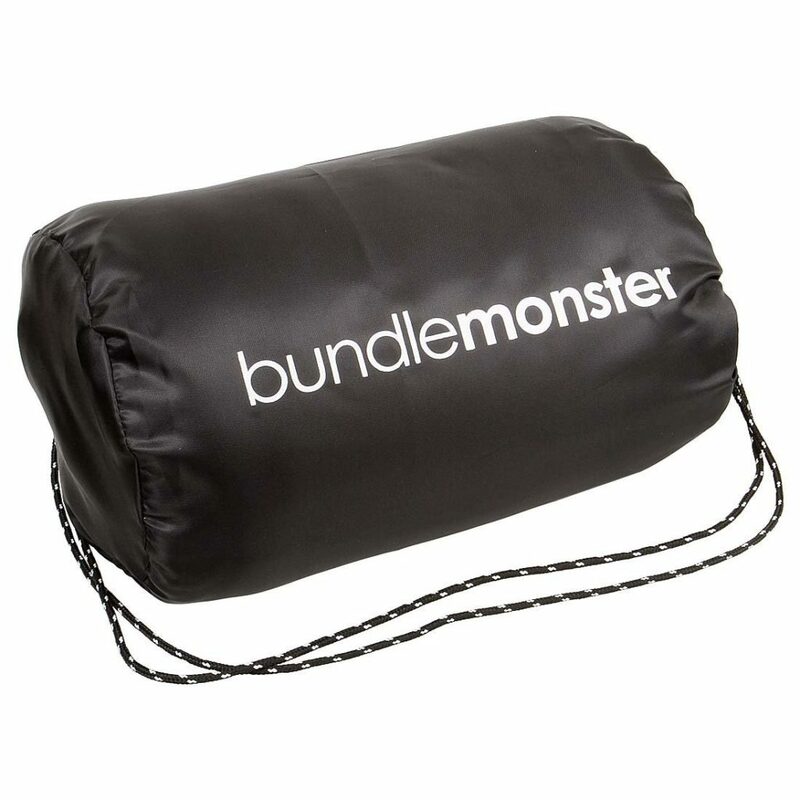 The Bundle Monster Fleece Sleeping Bag Liner can be a good recommendation for anyone who is not aiming to travel too light or minimal. It is definitely high on versatility if you ignore the non-waterproof aspect. Washing it is also not a huge issue, making it a fairly convenient option. The material is nice and comfortable, which means that you can rest easy inside your bag or outside it. Sleeping bag liners in polycotton are a great alternative to cotton liners, as they combine the comfort and durability of natural and synthetic fabrics, lending them some of the best features of the two. The Trespass Slumber Sleeping Bag Liner is great for packing light, while the liner can be rolled down to a small enough size to ensure a fit into your bag along with all the other stuff that you need. Being made of a polycotton material, it definitely survives frequent washes better that cotton liners, while also managing to dry out fairly quickly. Another point is that the Trespass liner weighs significantly less than any other liner that comes in a similar material. It also comes in a kid’s size in case you are traveling with a younger camper. Overall, it is a good pick in our list of the best sleeping bag liners to take along on your camping trip in warm and cooler areas alike. If you want the comfort of a silk liner but are afraid that it will leave you feeling cold inside your bag, the Trespass Slumber Liner is a great option to go for. The fact that it comes in different sizes makes it a good choice if you are going to travel with various kinds of people too, including kids. Packed in its own Stuff Sac. Measures 165 x 60 x 40cm. 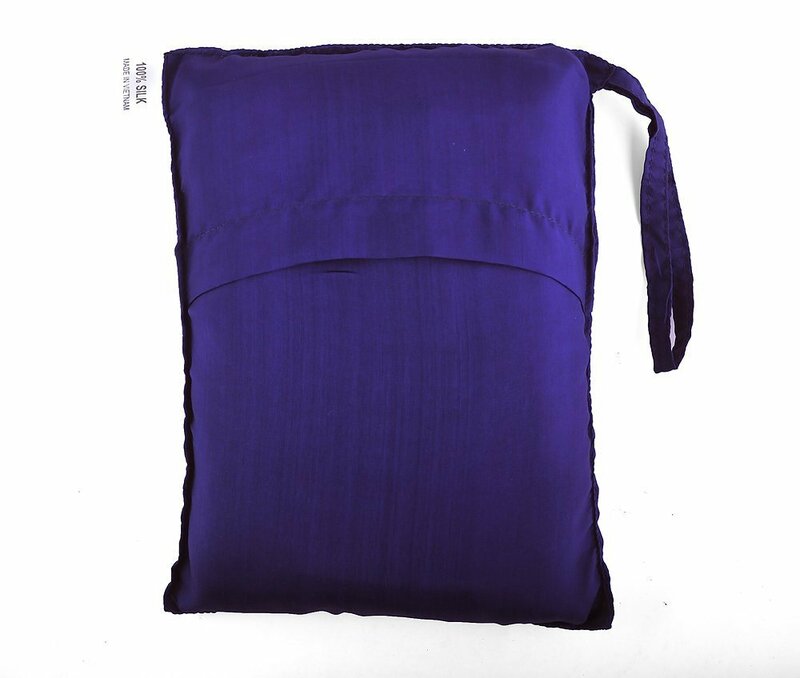 For you fancy camping desires, the Marycrafts Pure Mulberry Silk Sleeping Bag is a wonderful liner that you can use inside your bag to keep you comfortable and sweat-free even on warmer nights, while keeping your bag free of the dirt and grime that you may carry inside it. Along with all the great properties of a silk sleeping bag liner, the Marycrafts one is especially great for use in the summer because of its construction. The flaps do not close all the way at the sides, and the front may be cut a bit too low for some. But these leave enough space for a good amount of airflow, thus leaving you comfortable even when the mercury soaring. It also comes in a lot of color options to choose from, each of them is bright and eye catchy, and they come in a matching carrying pouch to add to your convenience. It feels soft against your skin, is completely handmade, and packs into a really small size. With silk liners being the most preferred ones used by campers around the world, this Marycrafts liner in mulberry silk adds another great option to the list of the best lightweight sleeping bags. We love how comfortable it feels without being restrictive at all, and the pop of color adds a bit of fun. Consider buying this for your next outdoors stint under the warm clear skies. The last pick on our list is also one of the best sleeping bag liners for backpackers. The Friendly Swede’s polyester liner comes in a rectangular shape that is very easy to slip into. There is plenty of room for tall people to move around in it as well. Besides that, unlike most synthetic materials, this sleeping bag liner actually feels a lot better on the skin. It is super convenient to use in several aspects. So carrying it inside your backpack is not a problem at all as it packs down to a very small size. Moreover, it is very easy to slip into your sleeping bag, and the pillow cover on top can act like a hood. An added bonus is the aftercare. Being built of a strong synthetic material, all you have to do after a sweaty trip is to throw it inside a machine as dry as usual. You can choose to wash it by hand as well. It is sturdy, easy to carry, and easy to clean. 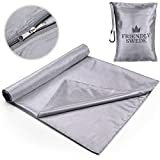 The Friendly Swede Travel and Camping Sheet Sleeping Bag Liner is a great find for backpackers who are looking to travel cheap and light. This liner lets you travel clean, provides protection for both your sleeping bag and you, and is very convenient to use all around. We can already hear many of you asking this question. You may have invested in some of the top quality sleeping bags and sleeping pads available, but the truth is, you in-tent comfort levels will fail to reach optimum levels until you invest in a good sleeping bag liner. As the name suggests, this particular item is supposed to be used inside a sleeping bag, but its functionalities go far beyond comfort and convenience- they keep you safe from the harsh exterior conditions and even help your expensive sleeping bag last a lot longer. Essentially, a sleeping bag liner is a camping/ traveling item that is to be slipped inside your sleeping bag. There are a number of reasons why you absolutely need to invest in the best sleeping bag liners suited to your needs. Firstly, they help with hygiene. You need a good sleeping bag liner if you are prone to traveling a lot and opt for budget friendly boarding solutions. Consider this: you are a backpacker who spends the night in either hostels or cheap hotels to spend the night in. While bedding may be your primary requirement, in this case, you will find that most of these places do not boast of the highest standards of hygiene. You may think that your best bet is to carry some extra clean sheets to be slipped in between the covers. But carrying a sleeping bag liner instead of sheets makes the job a whole lot easier. This is because a sleeping bag, especially the ones that come in a mummy shape, is designed to eliminate the need to carry multiple sheets- a single one would suffice. Moreover, the materials that they are made with make them really easy to pack as well as clean and dry. On the first front, the best sleeping bag liners will fit into your already stuffed backpack conveniently because they can be folded into the size of a larger handkerchief and weigh nearly just as much (depending on the make). These same materials also ensure that you can wash them as frequently as you like. Drying them takes very little time as well if they are made with synthetic materials or silk. On the other hand, the best sleeping bag liners do a lot to extend the durability of your sleeping bag. Most quality sleeping bags do not come for cheap, and moreover, based on the kind of insulation and protection they provide, can require high levels of maintenance. It only makes sense to take good care of your thoughtful investment. But if you have developed a habit of slipping straight into your sleeping bag, then, needless to say, you will need to wash it a lot more frequently. On the other hand, if you use a sleeping bag liner inside your sleeping bag, you will protect the interiors of your bag from the dirt and oils on your body, along with other things that cling to you that could potentially harm your bag. This in turn positively affects the hygiene levels inside your bag as well as its functionality. So as you can see, a sleeping bag liner is a must for traveling light and safe. Anyone who is an avid traveler or outdoor camper needs to invest in a quality sleeping bag liner. The best thing about these items is their versatility, which makes them useful both inside and outside a sleeping bag. Besides protecting your bag and making your crucial resting time far more comfortable, sleeping bags also keep the bugs away, thus keeping you safe from possible bug bites and infections. So if you are in the habit of spending the night outside of your home quite often, it is best to buy a good sleeping bag liner to be on the safe side. As with all camping gear, sleeping bag liners come in several kinds. But the most prominent classifications happen in terms of the material used and the kind of insulation they offer, and each one of these can make all the difference in the world through your camping experience. These classifications are as follows. Silk Sleeping Bag Liners: Being a natural fabric, silk is one of the best materials to keep direct contact with your skin. Sleeping bag liners made of silk not only offer comfort as they feel really good on the skin but are also really quick to dry. So even if you get them wet during wet weathers, you can count on them to dry out quicker than other materials. The organic nature of silk also makes it more hygienic compared to polyester liners. Do keep in mind that these do not provide any additional warmth, so a lone silk liner will not do anything to aid your insulation during wintry ventures. However, they score the highest in terms of packability due to being extremely lightweight and easily foldable into tiny sizes. They are also great for protecting your expensive sleeping bag from sweat or dirt. You should go for these if you are traveling light during high summer. Cotton Sleeping Bag Liners: Another organic material, cotton is one of the most demanded materials in the world for the comfort and breathability they offer. They are also high on endurance and can serve as excellent protections for your bag. However, we do not usually prefer going for sleeping bag liners in cotton material, as they are much heavier and not as easily packable as silk. They don’t let you slip as easily into your bag either and take a lot of time to dry. Synthetic Sleeping Bag Liners: Liners in synthetic are one of the most preferred ones throughout the world for outdoor campers because of the way they feel on the skin. Synthetic materials are also famed for being very sturdy and can be used and reused many times over. They are also easily washable, but they do tend to become really heavy when wet. On the other hand, however, they can dry pretty fast if the fabric is a lightweight one. The best thing about synthetic liners is that you get a lot of options to suit your needs, and they are available at affordable prices. They can also be warmer than silk liners and are very easy to slip into. In addition, synthetic liners provide good protection to your bag, making them a good choice for prolonged use. 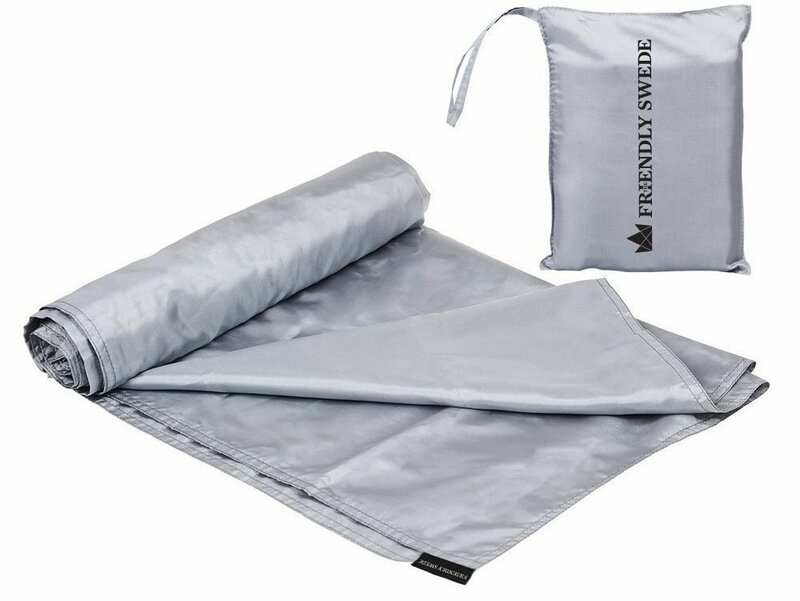 Fleece Sleeping Bag Liners: While fleece liners are generally harder to pack into a small bag, they are very comfortable and comparatively lighter than insulated sleeping bag liners. At the same time, however, they can provide ample warmth. The moisture wicking properties of fleece make them ideal to keep wetness away from your bag while adding extra protection against oils and sweat. But while they are quick to dry, the warmer kinds can be quite bulky and heavy too. You can go for those of you don’t care for the extra space and weight they add to your travel. Expander Sleeping Bag Liners: Expander Liners are great for being stretchy and can be pretty lightweight. They also offer excellent protection against bugs and other microbes and are available in varied sizes. Expanders are a good choice if you are on a budget. 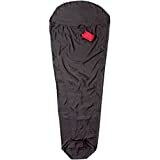 Insulated Sleeping Bag Liners: If you prefer to travel with a lightweight sleeping bag for backpacking for all weathers, then this kind of liner can be your savior. These are excellent options if you are looking to upgrade the season rating of your bag, or if you fear that your bag may not live up to its claims of providing warmth. Insulated liners come in many different varieties and can provide warmth factors of up to 25°F. In addition, these can be very thin. Most of these come with synthetic insulation and hence can be easily washed. However, they don’t pack nearly as small as synthetic sheet liners or silk liners, so if you have a space crunch, these may not be an ideal option for you. For the sake of better traveling, we suggest wearing insulated garments like down jackets rather than sleep in these at night. For traveling in chilly places, however, these can be great if carrying is not an issue. If you are smart enough before buying your camping equipment, most of them will last you through the years. However, there is no point being stuck with an unsuitable item that you have you compromise when you are trying to have the time of your life in the outdoors. That is why it is essential to know about some of the factors that will help you in your search for the best sleeping bag liners 2019. 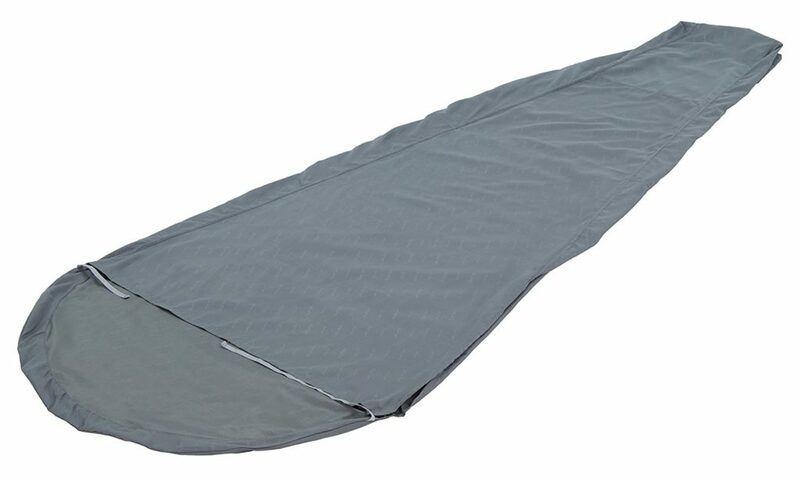 If you have not realized this yet, a quality sleeping bag liner can make all the difference between a good and comfortable camping experience and a terrible one. So learning about some of the major factors related to buying a good liner will do more than just educate you in theory. You can save a bunch of money as well as time if you know exactly the kind that will suit you. If you are a regular camper for all seasons, however, you probably know that there is nothing called the perfect equipment for all purposes, and the case with liners is similar. So most seasoned campers will probably have at least two kinds of liners for their requirements- one for summers and another for wet/cold climes. But if you are only likely to go out once in a while and have a preference for a particular kind of weather for camping, maybe you can get away by owning one specifically for the purpose. Despite this, you will still need to be aware of much before you end up buying the best sleeping bag liner for yourself. Read on to know about the things that you need to consider before buying the best sleeping bag liners. This refers to the places that you are most likely to camp out at or the time of the year. In the first case, considering the where is important because every place is different. If you are going to spend a few nights camping in a forest, then your requirements will be different from when you are doing that in the mountains. There are several lines that come with a special bug-repellent coating for forest areas or warmer climates. The time of the year is equally important, but that has to be considered in relation to the place. Some places are likely to be comfortable even in winters, while others will be freezing cold (for instance, if you are looking for a liner for your Alpine climbs. A little research and subsequent preparations go a long way, so make sure you know about these beforehand. This is related to the point directly above it, but being one of the biggest determining factors in buying the best sleeping bag liner, it warrants a different section. We have already discussed the different types of sleeping bag liners available on the market, so it should be fairly simple for you to decide what type you will need. Depending on the climate you are venturing out to, the material used for the liner you are about to purchase is an extremely important aspect to consider. For summer months or wetter climates, we would recommend going for a silk liner as they are naturally bug-repellent and dry very quickly. They keep you comfortable enough even when you are prone to sweating a lot, so that makes them a great choice for summer backpackers. If you are going to colder destinations, however, it would be best to carry an insulated liner to be on the safe side. This depends on how much space you can spare in your luggage, which is very crucial when you are traveling light or camping. Silk liners pack in really small, thereby taking up very little space in your bag. On the other hand, an insulated liner or a fleece liner will demand more space. However, it is recommended that you take this into consideration only in relation to the factors above. The best sleeping bag liners come in a variety of shapes and sizes to suit every need. If you are built higher than average, consider getting a larger one, and so on. Besides that, if you are looking to keep warm, then a mummy shaped liner might be best for you as they fit tightly around your body an trap heat. But if you aren’t comfortable (which is why many do not prefer mummy bags), look for a more generous fitting one instead. Most of the best sleeping bag liners are easily washable because that’s the whole purpose anyway. You can wash them in the machine or just use a gentle hand washing technique to get rid of all the dirt and oils. Make sure to read the washing instructions that come with your liner. However, DO NOT put it in a dryer; they are best dried normally out in the open. Lay flat on a surface and let dry. We have tried our best to tell you the factors that will help you go for the most well-suited ones for your requirements. But you will be the best to judge what works for you and what doesn’t. To ease your search, we have provided a list of the best sleeping bag liners buying guide. In conclusion, we would like to say that we have tried to be inclusive of some of the most favored liners used by climbers, campers, and backpackers. So on this list, you will find variation is materials, size, and shapes to help you find exactly what you are looking for. Best Sleeping bag liners for warmth are difficult to come by, but here you can take your pick from thermal or fleece ones. Silk is one of the most favored materials used for liners, and there are plenty provided here, each with their own unique features. Lastly, we have also included the best synthetic sleeping bag liners that are light to carry and efficient to be used many times over. We hope this post has been helpful, and you will find the top liner suited for your requirements. And if you have any suggestions, let us know in the comments section below.